Masai Mara has become the seventh wonders of the world after attracting millions of tourist every year for the famous wildebeest migration. Camping both luxury camping and budget camping are the most preferred adventure people looks for. Adventure in Masai Mara becomes the exciting tour after joining other travelers who have the same interest. 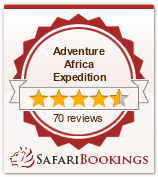 Africa tours are the most requested expeditions and adventure africa expedition offers you the serenity of africa. Pick from your Nairobi hotel. 08.00Am, Depart for the Masai Mara Game Reserve, stopping at the viewpoint of the Great Rift Valley and at Narok town for lunch. Arrive in time for a late afternoon game drive in this park, which is essentially the northern extension of Tanzania's Serengeti National Park as an artificial border only separates the two. Dinner and overnight will at the Mara camp. Masai Mara is renowned for it’s high animal concentration and abundance. Black-manned lions, elephants and buffalo can be seen (3 out of the big 5) though luck is essential for spotting leopard and rhino, which make the other two. The reserve is essentially the northern extension of Tanzania ’s Serengeti National Park and is home to numerous plains game including the migratory wildebeest, the common zebra and the Masai giraffe as well as antelopes like Thompson’s gazelle, hartebeest, impala and Dik Dik among others. After breakfast and your last game drive, depart the Mara region for Nairobi with lunch en-route, arriving in the late afternoon/early evening.